Really exciting news here. There’s a new site specializing in digitized versions of German magazines from the 1st half of the 20th century. Here’s the description Illustrierte Presse provides on its site. Illustrated magazines from the era of Classic Modernism are a rich and esthetically top-rate source for the history of the period between the wars with regard to everyday life, culture, communication, design and photography. Our website offers the complete inventories of “Querschnitt”, “UHU”, “Kriminal-Magazin”, “Jüdische Magazin” and “Auto-Magazin”, soon to be joined by five more titles. Ten of the most important German-language magazines of the period with roughly 650 issues, with 75,000 printed pages and more than 50,000 illustrations have for the first time been compiled virtually and made available to both researchers as well as to readers interested in cultural history. It’s like a German MJP. Awesome. In the world of digitized magazines, ads are a good thing. 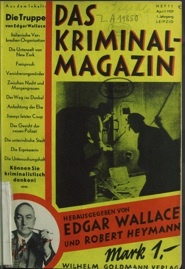 Scholes and Wulfman make a persuasive argument in Modernism in the Magazines that advertisements represent an important part of our heritage. That’s why it’s such good news to hear from Barbara Pezzini, Project Manager at the Burlington Magazine Online Index, that they’ve just received a grant to catalog their ads. The announcement is below. As you know, the advertisements placed by art dealers in The Burlington Magazine since 1903 (a data bank of circa 90,000 images) are an unexplored source for the study of the art market and its contribution to art history. They supplement directories to reveal the locations of galleries and are an essential tool for mapping the expansion of the commercial art world during the twentieth century. They also include photographs, providing visual evidence of stock held by dealers. Finally, and most importantly, these images provide important evidence of untraced works of art and their whereabouts at a given moment: the digitisation of these resources will greatly aid provenance research. The cataloguing of the dealers’ advertisements and their images is a significant scholarly project that will contribute much to our knowledge of the twentieth-century art market and will make accessible much information which currently is unavailable.